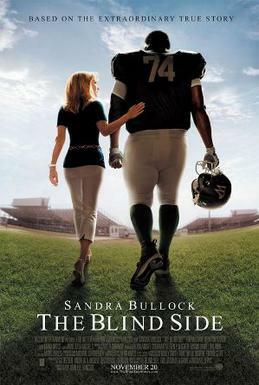 We have seen the film “The Blind Side”, directed by John Lee Hancock in 2006. The film is based on a true story and the action takes place in Texas, USA. The story is about a boy called Big Mike or Michael. Big Mike comes from a poor childhood where his mother took drugs and his father left before he was born. After running form every foster family he has ever had, his educational level is poor, but he is not stupid. He decides to attend to a good christian school, but he has no place to live. One night he is walking the streets looking for a place to sleep when he is picked up by the Tuohy family and his life changes completely. After living with the rich family for a while they decide to adopt him and he becomes a legal part of the family. Big Mike is an eager football player, and a huge talent. Because of his talent he is offered scholarships from almost every college in the southern states. The film is called “The Blind Side”. The blind side is a term in the world of football. It describes the place the where the Quarter back is most vulnerable when he throws the ball. Usually the coach places his best tackeler in the position to protect the blind side. This is Big Mikes position. And a frase that is used a lot in the film. that is right the blind side is symbolic meaning we have a lot of people living in our blind side as well. You were supposed to compare this movie to another movie or book you have read!